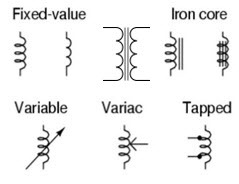 Examples of fixed and variable inductors. Radio Frequency coils (RF coils) are also called inductors. They are typically measured in fractions of a Henry. 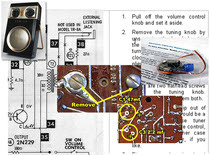 They can be variable values or fixed values, so, some are adjustable while others always present the same characteristics to the circuit.Transistor sets typically use coils rated in microhenrys (µHY) or millihenries (mh or mH). Some RF coils have two separate slugs. One is adjusted from the top, the other from the bottom of the coil housing. 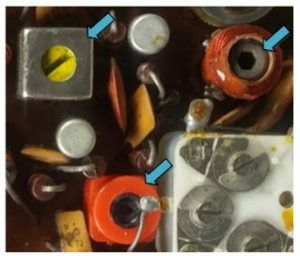 The orange device in the upper right corner is an oscillator coil. 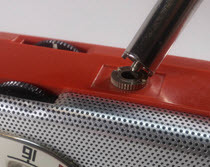 It’s adjustable as well, and controls the frequency of the IF circuitry. The other illustration shows typical schematic symbols. Without getting too technical just yet, IF coils like the one in the upper left corner of the photo are transformers with primary and secondary coils. A powdered core is screwed into and out of the can to change its characteristics. IF coils pass RF signals from one stage of the amplification circuitry to the next while isolating DC voltages in the process.